The Heifer Foundation recognizes annually an individual or family project recipient that has taken “a minimum of resources and converted it into a sustaining source of income and other resources, while also helping other families and the community at large” through it's Golden Talent Award. What is the Heifer Foundation? The Heifer Foundation was founded in 1991 to develop and manage an endowment to support the work of Heifer International. It is a separate non-profit charitable organization assisting donors with various planned giving instruments that meet their needs. While the details of how the Golden Talent Award came to be are lost in history, it is purported to have begun as an award developed by Heifer International’s Asia/South Pacific team for their programs in the early 1990’s. The award was so well received that that team recommended expanding it to encompass all of Heifer’s international programs, which the Heifer Foundation did. As operated currently, staff from each country program nominates an individual or family to the Area Program Team at Heifer International Headquarters for consideration. A selection committee consisting of dedicated Heifer volunteers from around the U.S. lead by Steve Denne, COO/EVP of Programs, selects 15 winners to receive special recognition of their excellence in sustainability. One winner is selected per country each year. The winner receives a cash award of US$1,000 provided by Heifer Foundation. Out of the total award, US$800 goes to the project community and $200 is designated as a cash gift or in-kind gift to the family or individual. Learn more about Heifer Foundation. Read about the winners of the 2012 Heifer Foundation GoldenTalent Award. 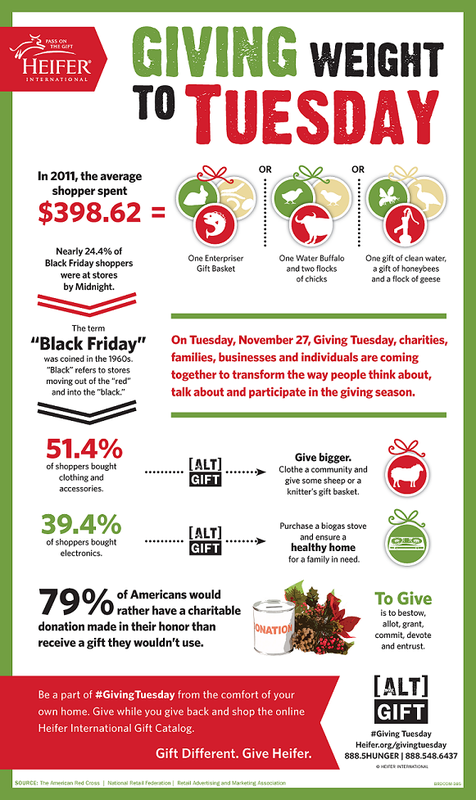 A group of generous donors is offering to match your gift to Heifer International – up to a total of $438,000! Make a gift today and you can help Heifer reach twice as many people with the tools and trainings they need to build a better future and lift themselves out of poverty. This holiday season, partner with a group of generous donors to help ignite change in the lives of millions who are poised to come out of poverty. With your help today, twice as many malnourished children will have milk to drink. Twice as many anxious parents will be able to pay for school fees. And twice as many impoverished families will be able to move closer to self-reliance! Plus, because each family who receives Heifer livestock agrees to Pass on the Gift of offspring to help another family in need, the impact of your gift today will continue to multiply even for generations to come. · Hiking event – This is much like a fun run, where participants get sponsorships for completing some or a whole hike. · Walk/Run event on the American River Parkway – Possibly join an existing walk/run event and create a group of the participants dedicated to donating to Heifer. · Beggars Banquet – This would be similar to our Food Table activity, which helps people experience the disparities that exist worldwide between the fed and the hungry. · Pig Roast – This can be an element combined with any one of the three event ideas above. · Yogathon – This event would offer different styles of yoga instruction every hour for a set duration. Participants would get sponsorships to complete a set number of hours of yoga. · Evening of Drumming – Musically talented friends of Heifer would offer an evening of drumming with proceeds going to Heifer. A local coffeehouse has offered free space in exchange for purchased of food and drink for Heifer events. We attended 22 charitable campaign events including the kickoffs for Sac County Employess and Calif State Employees Charitable Campaign and the federal workers’ Combined Federal Campaign. Some were tiny; some were huge. We will look forward hopefully to tracking results. The gracious folks at Calif Department of Managed Health Care sent a contribution check through the mail to Jill Kilty-Newburn. John Brewer and Linda Eisenmann presented at a Kiwanis meeting and remarked on the alignment in goals between Kiwanis and Heifer. Judy Grimshaw, Suzanne Awalt, and Pat Sayer-Handley did the complete worship service and Sunday School at Fair Oaks United Methodist Church, an enthusiastic and warm group of folks. JoAnn Peter and Sue Bennett assisted with the annual Alternative Gift Fair at Carmichael Presbyterian Church; reported $1200 in contributions plus $200 additional via sales of Nifty Knitter items. Susan Rumberg presented a complete wrap-up of the results of tabling at the Davis Farmers Market seven times between February and October of this year. The stated goal of this trial was to generate speaker requests for our group. After expending a total of 95 hours of volunteer time for the seven months, the tabling generated one request that was carried to fruition. The Davis Farmer’s Market is one of few markets in the region that permit tabling and allow organizations to staff their own tables. Susan found that the majority of visitors who stopped at the table were already familiar with Heifer. Considering the investment of time and energy, Susan recommended, and the group agreed, that we do not continue tabling at the Davis Farmer’s Market in 2013. Alternative Gift Fairs are on the horizon for November at Davis Community Church (Sue Bennett) and Spiritual Life Center (Judy and Pat). Pat Sayer-Handley needs a couple of helpers for a booth and sale of materials at an Alternative Gift Fair on December 2 at Sac City College Cafe at 11 am to 1 PM. The theme: Learn about gifts that don't hurt the environment. We will be there with Heifer Information and Nifty Knitters. With the holiday market season well underway, Teresa Fung shares information about some ceramic boxes donated by a local artist for use to generate donations to Heifer. A local artist, Jeff Drullard, donated ceramic boxes he made for use to generate donations for Heifer. The 25 ceramic boxes are all about the same size, but all look different. They are simply made and earthy looking, artful, and clever. Sue Bennette and Jo Ann Peter took some to an alternative market and came up with some ideas of what they might be used for (fireplace matches, nick nacks). They sold one for $10, which is our suggested starting price. Please feel free to share other potential uses for the boxes. The inside dimensions are about the size of a recipe box. I still have a total of 18 boxes available (Jo Ann/Sue have 4). If you are planning to attend a holiday craft fair or any other opportunity to generate some funds for Heifer and can use the boxes, please contact me. Thanks!! Instead than sending just a thank you note to these sustained donor churches, the group decided to order and send the World booklet, a new Heifer publication as a thank you, along with a thank-you certificate. This will to be done in January. John Brewer will draft a letter. Suzanne Awalt reported on the progress in bringing a Heifer Study Tour into reality for our volunteers in the West. Jill Kilty-Newburn, Heifer's Area Engagement Manager based at Hidden Villa in Los Altos Hills, CA, has been advocating for us with Heifer's headquarters staff. We have good news to report. Here is the recent email from Jill. We propose a trip to Ecuador in late August/early September of 2013. (I am pushing for August, as I assume this makes it easier for some folks to travel. Let me know if this is not so true with our interested folks. This is also the end of the dry season, so getting there before the heavy rainy season would be good.) This would be for a group of 9 people, and I would be the trip leader. Deposits to reserve a space will not be required until after the first of the year; information on itinerary, costs, travel arrangements etc. would all need to come first, of course. I wish I could make a statement about costs, but I just don't have that much information yet. As I took a quick look at flights, on Expedia, costs for flights from Sacramento through Miami were just over $1,000. So, you see, we are moving forward. Hopefully, there is some flexibility on the size of the group, but it will be small in number. We do not know an exact maximum yet. One of us wondered whether we can credit Christmas gift donations to our Team Heifer account. This looks promising, if the recently-promised upgrades work out. New Team Heifer is coming soon! We have listened to your requests for better functionality, and are excited to announce that in mid-November, we will debut a new, improved Team Heifer experience. In the meantime, the ability to start or join teams, or make donations has been paused. Your continued patience is appreciated as we complete the new Team Heifer. We think it will be worth the wait! Suzanne Awalt met with longtime Heifer volunteer Emily Shiflett, who is now a student at UC Davis and is enthusiastically looking for ways to bring knowledge of and support for Heifer to her fellow students. Suzanne assured her of the group’s support as she decides what tack to take. According to Susan Sundell, the 2011 Annual Report is not available yet. She will call headquarters later this month to see if it is completed. According to Jill, Holiday Issue of the World Ark is now available. There are great articles on Bangladesh and Malawi. And of course, the Holiday Gift catalogue is in the middle. This is a great issue to share with friends, family, your doctor’s office, local library and more. World Food Day 2012 (October 16) – It’s theme: Ag cooperatives leading the way to feed the world. Pierre Ferrari, Heifer CEO, speaks about Heifer's cooperatives. Heifer's Seeds of Change partners with the National Farm to School Network. A recent article talks about International Women’s Coffee Alliance, an inspiring nonprofit very much aligned with Heifer’s belief in gender equity and the value in empowering women. Professor Beth Erickson from CSU Sacramento explained her program in Recreation, Parks and Tourism Administration and helped our group explore ways we might partner with her students. Each semester 40 students in her senior class are required to plan and implement a big event. In the past they have done everything from golf tournaments to wilderness film festivals. The students work in pairs to organize an event guided by advice from Beth. The student pairs are responsible for the planning and all of the “foot work” involved …i.e. contacting vendors, providing publicity, writing sponsorship letters for donations, etc. Our obligation to the students would be our availability on a weekly basis for guidance. The events are usually planned for November during the fall semester and in late March and early April for the spring semester. We will discuss the possibility of partnering with a pair of students for a Heifer event in the spring at the next volunteer meeting. We need to let Beth know of our interest by January 2013. So far our volunteer group has met all Calif State Employees Charitable Campaign AND Combined Federal Campaing requests for tabling and speaking events. We have had a busy September and October with a total of 19 events (not counting some that might have occurred in Chico). Jill Kilty-Newburn will be tracking the contributions made to Heifer through the state and federal charitable giving campaigns we have been supporting this fall with our presence. We are hoping for information about the impact of our efforts. We will look at the list of churches sent out by Jill Kilty-Newburn and decide on a game plan for outreach at the next volunteer meeting. Judy will ask Jill to send us phone numbers and addresses for the churches on the list. We may send our volunteer postcard with a note, along with attempting to make personal contact. The Team Heifer site is being revamped at headquarters. There has been confusion over the team pages and individual pages but the site does correctly show $1,216 credited to our volunteer group. Checks to Heifer collected by our group should be mailed to Jill Kilty-Newburn. She will make sure the donations are credited to us. Cheryl is experimenting with donating via Visa directly on the Team Heifer site; results will be reported next meeting. What do you say to someone who wants this kind of information? • The donation to Heifer is a symbolic donation that supports the entire mission of Heifer International …including all of the training that the families will receive. • It can take many months before the training is completed and goats are placed with families. • To receive news about a donated goat would be logistically very difficult and would add another layer of expensive administrative costs. That money might be better spent providing animals and training for families. • The goat that has been donated will be a pregnant goat that may give birth to a female kid that can be passed on to another needy family in the community. Your gift will multiply with the passing on of goats and ripple out into the community to help many families. • The pool of money needed for goats may be already met…but other animals may be desperately needed by the project partners. And so your donation may go to help those families. Record your volunteer hours for September on Google docs. Midtown Kiwanis presentation on November 2 -- John Brewer and Linda Eisenman will work together on this early morning event. Teresa Fung received a donation of 27 ceramic boxes from ceramicist, Jeff Drullard. We are considering using them for tabling events, living gift markets, silent auctions etc. Judy Grimshaw will send Mr. Dullard a thank you note. Monday, November 5, 2012, Campus Commons Board Room 6:00 pm. We will discuss partnering with a pair of students for a Heifer event in the spring (see item 1 above). On Sunday September 9, I had the pleasure of celebrating with the congregation of St. Mark’s UMC (Arden-Arcade) and presenting them with their 20th Ark Plaque. 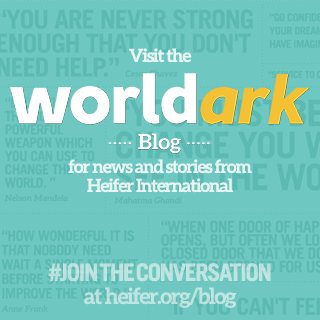 An Ark Plaque represents a donation totaling at least $5,000 and is symbolic of two of each kind of animal that Heifer gives to families around the world. While Heifer is blessed with groups of supporters that generously raise funds and receive the ‘Ark’ recognition, doing so 20 times is a rare and special occasion! I was greeted by Fred and Cecelia Stallcop, and Jane Henderson when I arrived; both the Henderson and the Stallcop families have been instrumental in organizing for Heifer within the congregation. It was good to hear about their history of involvement with Heifer, which goes all the way back to the 1950’s ad 60’s. We also saw the collection of the 19 Ark plaques prominently displayed in the Narthex, one even displaying a picture of Jane’s parents. The message this Sunday was delivered by Pastor Alan Jones and titled the Journey Forward. It focused on kicking off a series of sermons and group meetings on bringing faith to life through action. From my experience at St. Mark’s and their history of sharing their love with those in need around the world, I am confident that the journey forward will include their work of transforming the world into a place of compassion, justice, and peace. Are you a teacher or parent looking for a new way to make reading exciting for youngsters? Heifer International, the global hunger and poverty charity, has a fun and fulfilling way for teachers to enliven their class’s reading efforts this school year. Read to Feed is a powerful reading incentive program that also fosters in children a passion for helping others. It’s a well-established fact that developing a child’s reading ability, especially in the early years, is critical to that child’s future success. Teachers must constantly find new ways to motivate children to press forward with their reading efforts. Read to Feed melds the exciting work of Heifer International worldwide with specific reading goals. In Read to Feed, children (individually or as a group) get sponsors for each book they read during their challenge period. At the end of the program, the group pools its funds and decides which animals to donate through Heifer International, to help other families move from hunger to self-reliance. Heifer International has received an $8.5 million grant from the Bill & Melinda Gates Foundation for project work on the East Africa Dairy Development (EADD) project. The grant will support existing projects in Rwanda, Kenya and Uganda and explore possibilities for expansion in Ethiopia and Tanzania between July 1, 2012, and June 30, 2013. June 20-23: Table at the United Methodist Conference at the Sacramento Convention Center during lunch hour, 11:30-1:30. Saturday August 18: Table at Davis Farmers Market; signups via Google doc or contact Susan Rumberg. Wednesday August 22: Laurie Heller announced the date for the “Statewide Kick-Off” of the 2013 Statewide Charitable Giving campaign. This is a free event held on the west steps of the Capitol. Campaign representatives from various state agencies will be there to learn about organizations that merit contributions made directly from state employee paychecks. Laurie has made a contact with persons who schedules for this kickoff event. She will have more info at our August volunteer meeting. John Brewer, Cheryl McKinney, Judy Grimshaw, and Pat Sayer-Handley met earlier in the month to discuss our group’s future direction vis-à-vis putting on events. At various times the group has talked about putting on events which would involve a lot more work in planning and execution. The group saw little benefit in increasing the size of events, when there is already a history of success with small events and especially those involving personal circles. In the end, the group decided that continuing with small events provide a good key to our future direction, at least for the next year. Some ‘personal circles’ events include family dinners, birthday parties, book club events, alternative gift fairs, film showings, cookie exchanges, backyard bbq-s, backyard dinners, holiday caroling, and the famous Haiti event. A quick rough total showed that those events held over the past 18 months or so have raised approximately $9,000. This estimate does not include the revenue generated by the sale of products made by the Nifty Knitters. The group proposed using the tool of the “Team Heifer” section at heifer.org>Get Involved>Team Heifer. This tool is an on-line tracker of funds raised by our group. The group proposed to set a group goal of $10,000 for the next year, which all those present agree as entirely reasonable. · The button activity and questions eggs – These are very portable activities and effective conversation starters. · The bee bracelet activities – Kids are eager to participate in this activity. At the same time the parents stay nearby to talk with us. · Brochures for Heifer basics and agroecology, Cornerstones bookmarks, local postcards, and back issues of the World Ark are relevant and popular with visitors. For situations where attendees are adverse to collecting paper, make Quick Response (QR) codes for the Heifer website or the Sac Heifer blog available. · The spinner – This is useful in circumstances where there are a lot of kids and there is easy access to move this heavy piece of equipment. · Circulate – Make sure to circulate among the exhibitors and pass out Heifer business cards. New contacts and subsequent event invitations have been generated from doing this. Cheryl McKinney with the able editing assistance of Laurie Heller, Teresa Fung, and Susan Sundell had some new posters made up. The first gives the Heifer mission statement. The second centers around the concept of agroecology, with definition and a few examples. The third introduces the Heifer USA Seeds of Change program. The posters fit on our existing large trifold tabletop stand. Amy Flindt, our blog and electronic media guru is off to teach abroad. We will miss her at our meetings, but she will continue to work on our group blog as a co-blogger. Teresa Fung has volunteered to be the local co-blogger. Suellen Rowlison brought Chico visitors who made the long trek to attend our Sacramento meeting. Suellen introduced Suzanne Morrison and Shar Sentell, both are students at Butte College and now Heifer activists. Go Butte College! Suellen Rowlison is working on a time to tour the Chaffin Family Orchards and will forward more information when potential dates have been identified. · Sat. June 9 “Urban Ag Fest” Slow Foods Sacramento fund raiser for school gardens. We were invited by Chef Brenda Ruiz.